Hilton Towers Mumbai, Hilton Towers, Hilton Towers in Mumbai Maharashtra, Hotels in Mumbai India. 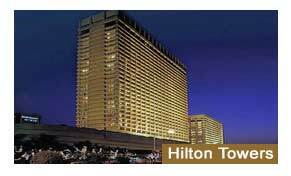 Reputed among the Five Star Hotels in Mumbai � Hilton Towers Mumbai is hugely popular with all kinds of tourists visiting Mumbai � India�s commercial capital. The exceptional services and facilities available at the hotel conform to international standards. The hospitality extended towards each and every guest at Hotel Hilton Towers in Mumbai is simply outstanding. The hotel lies in Mumbai�s commercial hub, at a mere 17 miles� distance from the airport, and is hence, easily accessible from major landmarks and business areas within Mumbai city. A city located on Salsette Island, off the west coast of Maharashtra state - Mumbai is considered the commercial and entertainment capital of India. The city has a deep natural harbor and the port takes care of a significant portion of India�s passenger and cargo traffic. Enjoy a varied choice of exotic dining options at Hilton Towers, Mumbai. The favored retreat for many a high profile business traveler, hotel Hilton Towers provides hi tech business facilities at the �Hilton Meetings� � a state of the art business center that remains open round the clock. There are private offices and conference venues located on the 35th floor, which provide breathtaking views of the Arabian Sea and Mumbai skyline. The hotel houses 9 meeting rooms, with accommodation capacities varying from 100 to 1000 guests. Indiahotelandresort.com offers online information and bookings at Hilton Towers in Mumbai, India. For further information on Hotels in Mumbai, please enter your queries in the form below.